An infographic purportedly depicting Palestinian attacks in the West Bank makes its case with a photo shot during a Bahrain protest. This would not be the first time the army posted misleading photographs to Facebook to serve its PR machine. On October 17, the Israeli military posted the above infographic on its Facebook page. 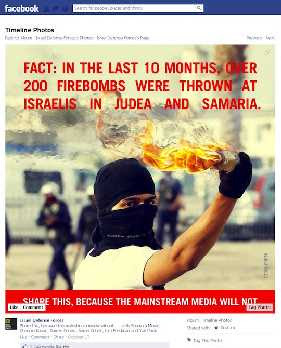 The image includes a photograph of a young masked man holding a firebomb and featuring statistics regarding the number of firebomb attacks against Israelis in the West Bank since the start of 2012. The Israeli military urges Facebook users to share the image "because the mainstream media will not." In fact, the mainstream media did share this photo extensively – in its coverage of protests in Bahrain. This powerful image has nothing to do with Judea, Samaria, Palestinians or Israelis. It was shot by Reuters photographer Hamad I Mohammed during protests in the Bahraini village of Salmabad last April. The Israeli military’s decision to use foreign photos to illustrate attacks in the West Bank as part of its propaganda efforts (without indicating that the image is only an illustration) may raise some interesting questions about its own ethical perception and standards. This is not the first time the army has faced this particular criticism. In June, the army marked gay pride month by posting a photograph of two male Israeli soldiers holding hands. It was later revealed that the two soldiers are not a couple and only one of them is gay. The use of a photo unrelated to the incident it purports to be illustrating was also more striking given the recent Israeli reaction to another alleged misuse of photographs. Last March, Israeli military and political figures demanded the United Nation’s OCHA office in Jerusalem fire a staff member after she tweeted a photograph of a fatally wounded girl, whom she indicated had just been killed by Israeli fire in Gaza. Pro-Israel activists and government officials maintained that the photograph had been published by Reuters in 2006 and a veritable campaign was launched besmirching the OCHA employee. Beyond the hypocrisy inherent in doing something that you had only just condemned others for doing, we should remember a key distinction between the two incidents: While the OCHA employee published the concerned photograph on her private Twitter account, as a private citizen, the Israel Defense Force is an official body and its Facebook page is an official government channel. There are two options here: 1) The Israeli military did not know the source of the Bahraini image and did not bother to investigate before choosing to use the image (an "investigation" that took me only five minutes); 2) The military was aware of the photograph’s origin and chose to use it anyway in a misleading manner. The IDF Spokespersons’ new media section has been contacted for comment. This post will be updated should a response be received.